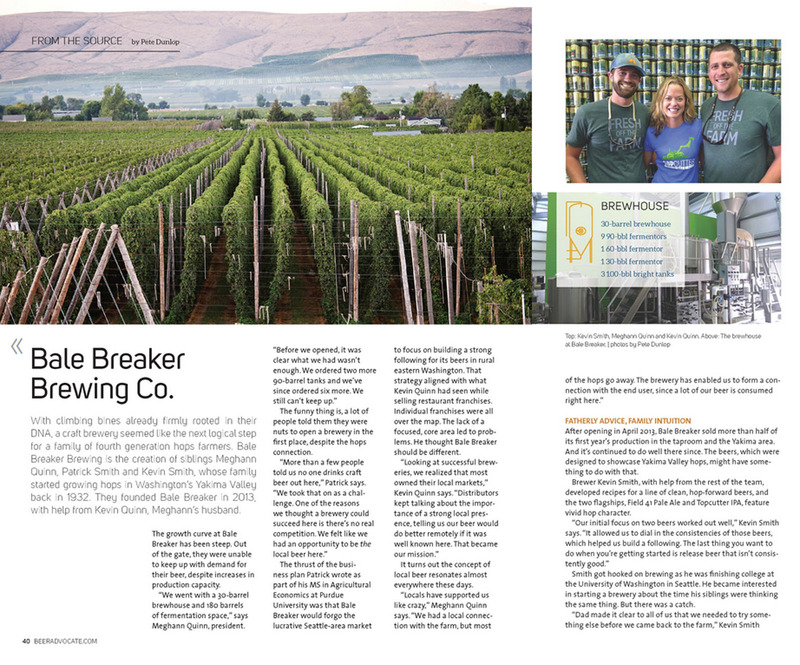 The October issue of BeerAdvocate magazine includes my profile of Bale Breaker Brewing, which is located on a hops farm in the Yakima Valley. As is always the case, the published version of the story leaves out a few details that may be of interest here. 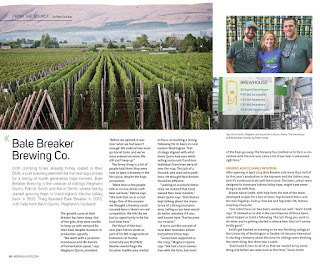 Bale Breaker opened in 2013, the creation of three siblings who grew up on Loftus Ranches hops farm, and another partner who married into the family. The kids had gone off in their own directions after high school and returned to the farm when it occurred to them that a craft brewery might go over well there. More than a few people thought they were nuts. 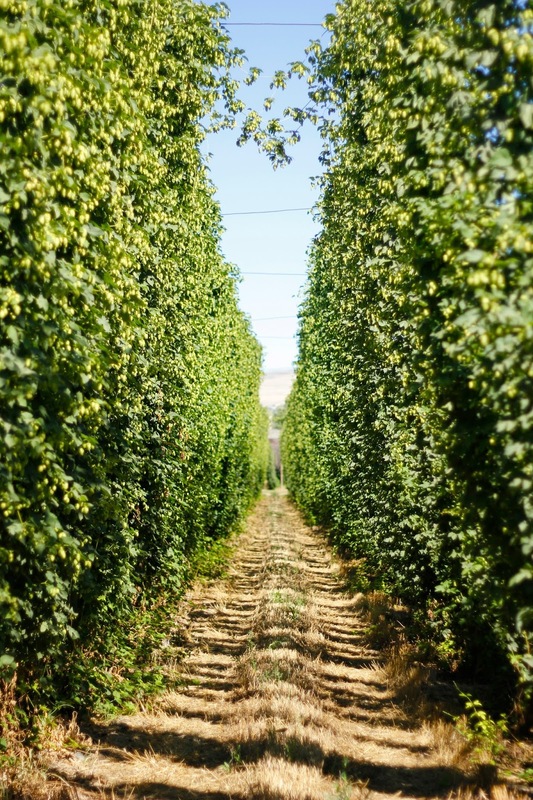 Even though the Yakima area produces hops that fuel brewers all over the world, rural areas like eastern Washington have been slow to catch the craft beer wave. Enough people in the industry told them they would fail that it caused a bit of self-doubt. Nonetheless, they forged ahead. The team of Patrick Smith, Kevin Smith, Meghann Quinn and Kevin Quinn (married to Meghann, the sibling of Patrick and Kevin Smith) put together a business plan that included some interesting details. 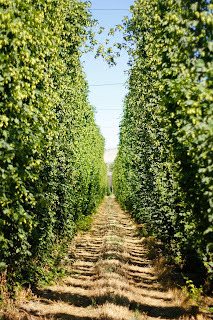 The brewery would share ownership with the hops farm, but be operated as a separate business. They did not want either business to be tied to the success or failure of the other. 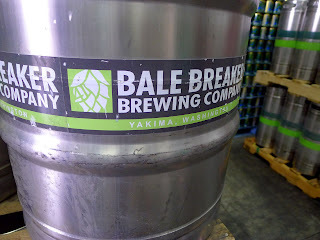 As well, they did not want other craft brewers to see Bale Breaker as competition. As it turned out, they needn't have worried about competition. Craft brewers don't operate like that and never saw Bale Breaker as competition. Keeping the businesses separate was mostly designed to insulate the successful hops business from the brewery, which might well fail. Due to their rural location, many assumed Bale Breaker would focus on building their brand in the lucrative Seattle market. They rejected that thinking. Instead, they were determined to build their brand in the local area and expand out from there. A few industry friends recommended that path. Kevin Quinn had worked in the franchise business and got a firsthand look at the problems associated with being spread out and not having a core market. He was convinced that they should start local and build from there. It's pretty common for new craft breweries to focus on draft sales. Bale Breaker had other ideas. Early on, they decided their flagship beers (two brands) would be packaged in cans and that packaged product would be their main focus. Looking out on the bar landscape, the Bale Breaker kids saw rotating tap handles as a dead end. A keg blows and something else goes on, no matter how fast the beer sold. They came to see shelf space in stores as the new permanent tap handles. If your beer moves, you keep your spot. Thus, filling cans is their priority, even if that means not filling kegs. The proof is always in the results. Bale Breaker has been embraced by the rural community. 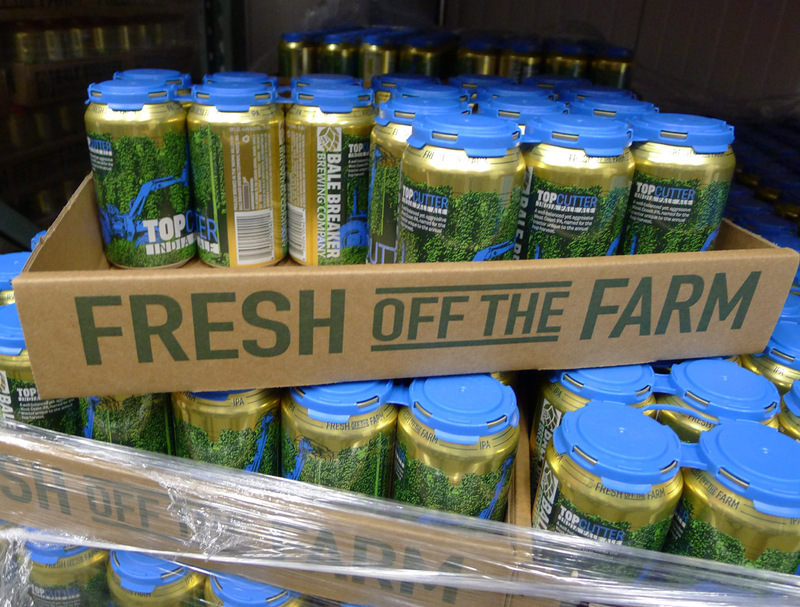 The distributed beers, Top Cutter IPA and Field 41 Pale Ale, sell so well that they are challenged to keep up with demand...despite expanded production capacity. If you're wondering, Bale Breaker beers are now available in most of Washington. Portland residents can find Top Cutter and Field 41 in many Vancouver stores and pubs. An in-progress expansion project at the brewery may allow them to tap Oregon in the next year or two. Hopefully. The full story is in the BeerAdvocate piece. There's no online version, though you can buy the issue on Google Play if you don't subscribe and don't want to. Cheapskates will seek copies in local pubs.